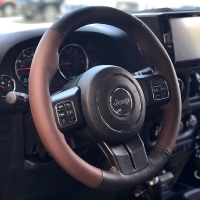 RedlineGoods steering wheel cover (2011-15 post-lift) custom-made for your Patriot 2007-17 - tailored-fit, not universal!. Availabile in over 40 types and colors of leathers/fabrics/threads, with lots of custom finishing styles such as stripes, piping, racing stripes. Best of breed products from a store with 99% 4/5 star ratings.